Of all the spells that people ask for when they visit the local hedge-witch, the most frequent ones are love spells. They want that perfect someone to appear out of the blue and love them. They want the stalker-lover to give up on them. They want to rekindle love that has gone sour or cold. They want to be free of the dead lover, so that they can love again. And so on. There’s nothing quite so tortuous as love when it comes to people attempting to wrestle the universe down and force its laws to bend for their convenience. Venus understands all this and has sympathy with every one of them. She’s the force of love itself. She’s also the force of beauty, aesthetic considerations, and art--all things that you can fall in love with. She deals in feelings and images, not rules and ethics. In every culture, the Love Goddesses have similar characters: they value feelings and aesthetics over all else, including right and wrong. Aphrodite is just fine with cheating on your spouse to get your needs met. Ishtar sees nothing wrong with cruelly discarding your lovers when you’re tired of them. Inanna sends her lover to Death when he isn’t glad enough to see her come back from the Underworld. Eros shoots his arrows randomly, taking delight in mismatched couples. Ezili Freda is the archetype of the mulatto mistress who wants to move up in social class by marrying her already-married white lover. The cow-eyed Hathor turns into lioness-goddess Sekhmet when she is enraged and devours entire cities. The love deities are all unapologetically irrational, as is Love itself. The first thing that you’re going to look at when someone comes in with love issues is, of course, the Venus placement in their chart. If you’re not a professional, but just someone who is having love issues of your own--and it’s rare to find someone who’s made it to adulthood and not had any--the first thing that you want to do is to look at your own Venus. What sign is she in? Is that the energy you want in a lover, or would you rather embody that Venus and have your lover be someone different? Below is a sample invocation for Venus in Aries. Later in this chapter I have provided invocations for each of the 12 signs and each of the 12 houses and you should look them over to see which one jumps out at you. If there is more than one, that’s all right. You might also look at the sign on your descendant, the line opposite your ascendant. This often indicates people that we are attracted to. Find the invocation for that sign and see if this appeals to you. If the one that you like best isn’t a sign that’s found much in your chart, that’s not too unusual; it might be an energy that you are missing in your life, or one that is in harmonious aspect to some of your important planets. Hail the Power of Love! Once again into a dancing blaze! With all your boundless energy love me now. The second likely thing that you’ll be looking at with issues of Love is chart comparison. Place one person’s chart over the other by lining up the houses with each other to see how the planets fall. You should be able to see conjunctions between the charts instantly, places where the planets pile up on top of each other. Looking at the comparison between the charts, you’ll read them just like you would a transit chart. In fact, you can think of it that way . . . two people, when they come together, are “transiting” each other, for as long as they are in each other’s presence. If they form a strong full-time relationship, those transits overshadow each other’s lives. The difference is that two people are theoretically equals, or at least when compared to a human being and a giant cosmic force. While the planetary forces don’t take much notice of us mere mortals, two people will always be affecting each other at the same time. While your critical Saturn is squaring his cranky Mars, that Mars is giving it right back to you. ". 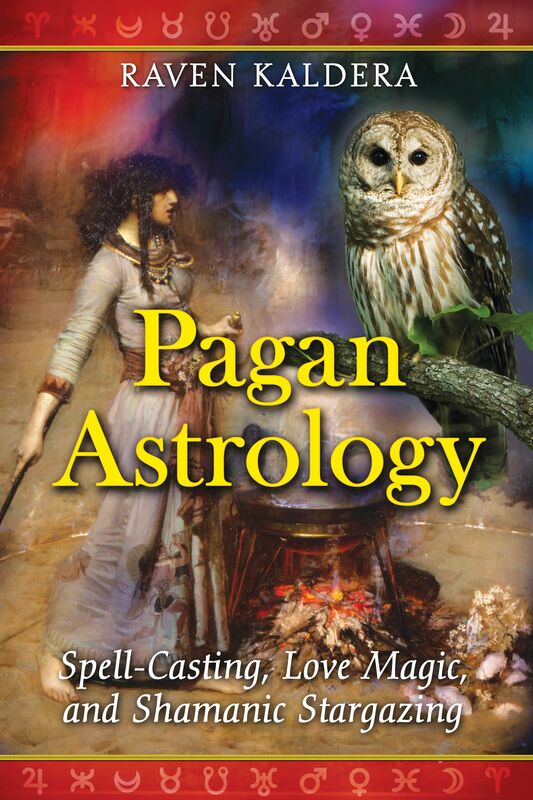 . . Kaldera does a good job explaining every detail, making it easier for astrology amateurs, like myself, to catch up. . . . For anyone interested in pagan astrology, Pagan Astrology is an excellent resource for spells, altars, and magical prescriptions." "Raven Kaldera has given us a completely unique and refreshing view of astrology. First of all, there are the eight lunar phases and a discussion of the actual lunar cycle of 29.5 days. He stays away from interpretations in favor of discussions that inform and educate and provides a huge amount of planetary-specific tabulations. This data allows the reader to create personalized responses to the various aspects and transitions of the planets in his or her chart. . . . If you have any interest in astrology, this is a book you want." "Kaldera provides an extensive compendium of modern magical remedies to counteract negative astrological influences and shows how to use planetary energy to aid Pagan worship and green magic practice through spell casting, love magic, and shamanic stargazing."